©Ingallei. Unauthorized use and/or duplication of text, artwork, or photographs in whole or in any part of it without express and written permission from the author is strictly prohibited. Somebody left the tomato eating spaghetti @ Rishikesh! This must probably be my fifth or sixth visit to the little town. 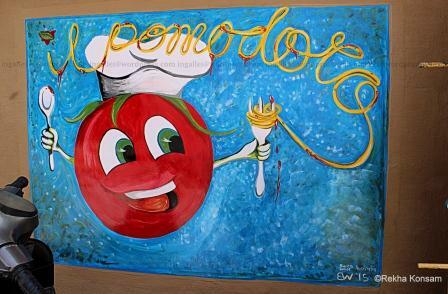 Caught sight of this big-eyed happy tomato trying to eat spaghetti on the walls of Rishikesh not far from the Laxman Jhulla. It was a sunny day and the sunny colours of the graffiti echoed it. The graffiti is signed ‘Bianca Wolff, Australia, EW 15’. Someone sure left her mark!